There Are Five Countries Representing Africa In The World Cup Finals In Russia In 2018. Since Friday, Senegal Has Scored A 2-0 Victory Over South Africa And Has 11 Points In Group D , While South Africa Has 4 Points. On Saturday, Morocco Had A Chance To Qualify For The Tournament In Russia After Having Wining Ivory Coast 2-0, With 12 Points In Group B.
Tunisia Will Also Represent African In Russia, Despite The Rally Of The Match Against Libya, Which Has Led To A Win Of 14 Points, And The DR Congolese Has Won By 13 Points. Nigeria are the First country to qualify to the World Cup. 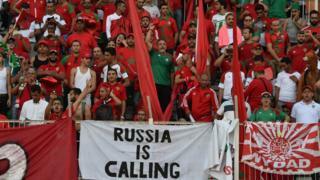 Being At the 1st in group B , With 14 Points After 1-1 with Algeria On Friday.